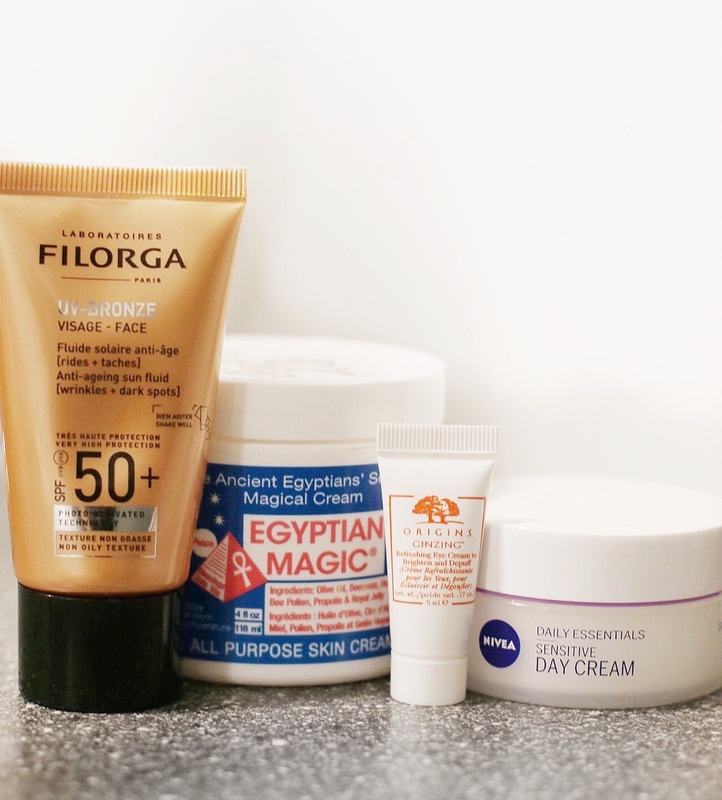 Since I posted my morning skincare products on InstaStory I thought I might as well write about them on the blog and let you guys know what I think of each products and what I like about them! I got this Nivea Day Cream in a goodiebox and it has been really good to my skin. It’s rare that I dislike a moisturizer so this one is good and affordable too. It does not really make any wonders but it definitely leaves my skin feeling hydrated! I finally started using eye cream. I got this one in the Goodiebox too and I’ve been enjoying wearing eye cream and taking extra care of my skin. Being in my late 20s it is probably time for me to be consistent with eye cream and make sure to apply it every day and night. It definitely brightens up my underlies and I love it! I’ve talked about Egyptian Magic a few times on the blog and the more I use it the more I love it. I use it for my lips and my hair. Also I started using it wherever I am really dry and need extra moisture like for instance my elbows. They are dry and darker pigmented since I’m brown and applying the Egyptian Magic defiantly makes a difference on the dryness. I’ve also started to use it on my legs. I’ve suddenly got some pigmentations on my legs, and I dont know why or how so I’ve been treating those spots with Egyptian Magic. At last I also use it for my nails which I feel like my nails are stronger and more healthy after applying Egyptian Magic. As you can tell I’m really happy for this multi purposed product! At last, I haven’t been consistent with using sunscreen. I barely wear it but I just bought this new sunscreen from Laboratories Filorga and I love it. Usually when I apply sunscreen it leaves my skin a little ashy and the creme is hard to blend out properly but this one is not like that. It is thick as the others but easier to work with and I’ve been enjoying it! Again; I’m taking extra care of my skin lately so sunscreen is something extra I’m applying than usual but I definitely think it is a must to apply the whole year around!